What makes KeyScrambler so special for its users. Encrypts everything you type in 60 browsers. When you go online, KeyScrambler encrypts every one of your keystrokes in real time: your bank logins, credit card numbers, search terms, web forms, emails, etc. -- everything you type on a website or a browser app is shielded from keylogging attacks. The unobtrusive green overlay window lets you see each of your typed keys being encrypted, which takes the guesswork out of the process. You have the peace of mind knowing exactly how and when KeyScrambler is working. If a keylogger has wormed into your computer and escaped detection, KeyScrambler will still work, and the keylogger will be recording only a meaningless jumble of characters. With a file size of ~1.5 MB, KeyScrambler doesn't slow down your computer, takes little resources to run, and requires no user effort. 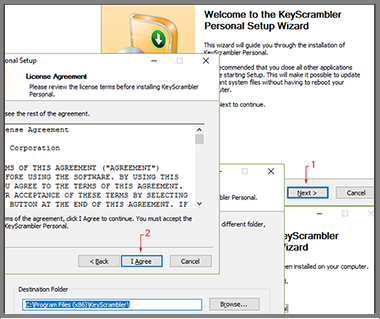 Installing KeyScrambler on multiple computers takes a minute and is as easy as on a single computer. You can turn the program off and on easily by double-clicking the KeyScrambler icon in the Tray area. Right-clicking the Tray Icon will bring up the Mini-Menu, where you can select a few more quick actions. This new feature works by altering your keystroke rhythm to protect your privacy on websites that try to get your identity through your typing patterns. KeyScrambler works seamlessly with most security suites and programs and authentication methods. It is an invaluable tool for strengthening your online information security. Online support responds to your needs. If an app that you're using regularly is not supported by the current version of the three KeyScrambler editions, you can email us to request it and we will add support in a later update version. Please check the lists of applications first. Premium supports 300+ standalone apps and more. Encrypts Windows Logons to protect your critical system. Last spring, Mickey Cashen, a retired high school science teacher from Brooklyn Park, Md., discovered that an intruder had accessed his older Windows XP computer to send e-mail spam to his friends, despite running an updated anti-virus program. After spending 50 hours over the next six months researching and evaluating security products, Cashen decided to opt for free Avira AntiVir Personal for basic protection, combined with a free firewall from Comodo. He also began using WinPatrol, a free program that blocks unauthorized additions to his PC's start-up sequence — a technique hackers use to re-infect your PC each time you boot up. And he relies on not one but three free Web browser plug-ins — AVG LinkScanner, McAfee SiteAdvisor and KeyScrambler — to help protect him from infected Web pages. "I learned that multiple layers of protection are preferred," says Cashen. "I ended up very satisfied with what I think is a small fortress." 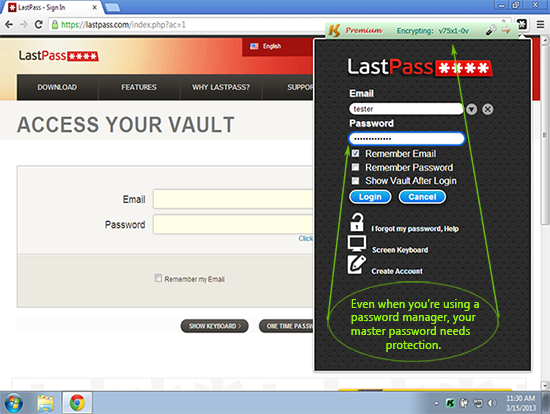 Read how KeyScrambler Premium's advanced security features will benefit your business. Your identifying info and digital assets are protected in major online games. 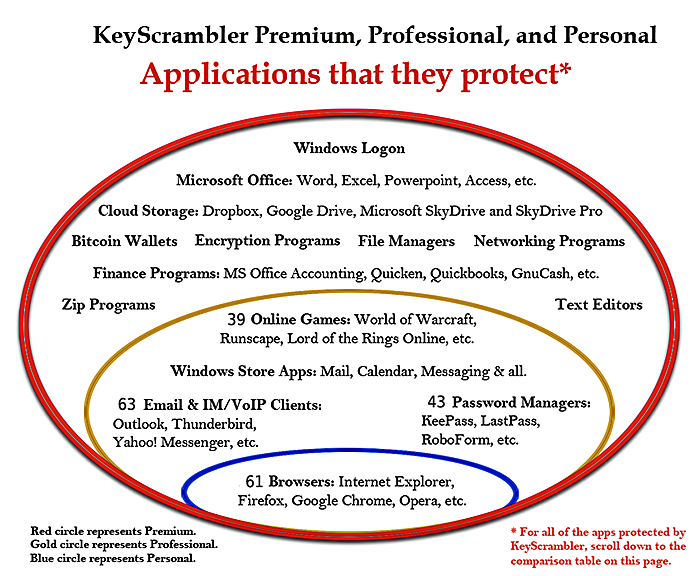 Images of KeyScrambler protecting supported apps are shown here. Read how KeyScrambler's smart engineering secures users' keystrokes against cyber thieves. Read KeyScrambler reviews by enthusiastic security experts, major websites, and bloggers. Find simple directions for tweaking KeyScrambler after you've installed it. Find all apps supported by different KeyScrambler editions in one place. Read excerpts of security reports and news articles about major security threats and counter measures.